West Yorkshire police and crime commissioner Mark Burns-Williamson. The jailing last month of two North London gang members who abused a teenage girl and trafficked her to Swansea in order to deal drugs marked a significant development in the fight against ‘county lines’. It showed how the Modern Slavery Act 2015 can be used to prosecute those responsible for coercing vulnerable people into carrying or selling Class A drugs. West Yorkshire’s Police and Crime Commissioner, Mark Burns-Williamson, who chairs the National Anti-Trafficking and Modern Slavery Network (NATMSN), said: “Clearly there’s a lot of violence involved in coercing and getting young people involved in this activity. They are victims. 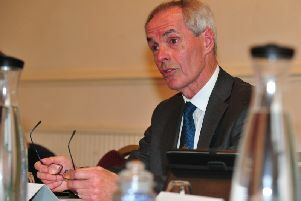 The issue of ‘county lines’ was high on the agenda when NATMSN last met and is the focus of a working party set up by the Association of Police and Crime Commissioners too. Mr Burns-Williamson said such regional and national collaborations were “really important pieces of the jigsaw”.